We found this adorable monogram frame and knew it was just perfect for Cinderella and princess lovers, a princess party and of course visits to the Disney parks. The monogram frame has 4 castles connected by flowers. The frame is made with the pretty colors of lavender, hot pink and light pink. 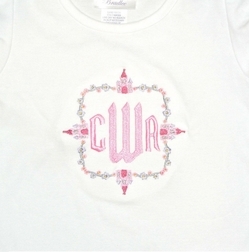 We monogram your little one's 3 initials in the center with a Fairy Tale style of monogram font. To complete the outfit, we pair the shirt with pink with white dots shorts with hot pink with white dots ruffles and white small scalloped ribbon between the two fabrics.